The crisis in Ukraine is in the spotlight of the media since the end of November 2013. A diplomatic crisis between the duo Washington-Brussels against Moscow. Where Kiev politicians are just pawns. A crisis turned into dirty war in the east, by the pro-Western Kiev junta that took power in the coup of 21 February 2014 on the orders of its masters, the USA and the IMF. A complex issue, full of hidden backgrounds where geopolitics, ideology, history, economic appetites, and NATO expansion to the East mingle and overlap. We open for you this issue with Luc MICHEL, international correspondent of AFRICA MEDIA and the EODE-TV boss. We will present four special programs UKRAINE VERSUS NOVOROSSIYA. This is the first devoted to the issue of the coming back of the Crimea to Russia. Crimea has seen two key events in the history of Europe and the world. At the Yalta Conference in 1943 and in the referendum of March 16, 2014. Luc MICHEL was in the Crimea at the time of the referendum of self-determination as with his NGO EODE he organized the International Monitoring Mission (Western reaction was a hate campaign against him, including over 1,200 defamatory articles). He shows unique analyzes made in the heart of the action of 15 to 18 March 2014 and also shares exclusive footage filmed by the TV crew EODE following him there. Here also the Crimean referendum in the heart of the event. In the Ukrainian crisis, history and ideologies are closely intertwined. The confrontation in the Crimea, which is that of two Ukraines, the one of the West and the one of the South East is above all an ideological clash. Fascism and anti-fascism, nostalgia of Bandera’s fascism and memory of the Great Patriotic War. Luc MICHEL explains in what this confrontation has both caused and precipitated the crisis in Ukraine and the uprising of the people of Crimea. Such a confrontation explains the results of the referendum of 16 March 2014. You will see in particular the rally of the victory of YES and pro-Russian people, on the evening of March 16, Lenin Square in Simferopol. That's what the NATO media will call without shame or remorse "a climate of fear and a referendum under the threat of the Russian army." You can judge by yourself! Our program closes with strong images. The crowd in Simferopol, which just received the results of the referendum on the night of March 16. YES is 96%. On the podium the leaders of the triumphant uprising, including the new president Axionov and the new mayor of Sevastopol. And sailors of the Russian Fleet. Then sounded a vibrant Russian anthem. Crimea is Russian again! 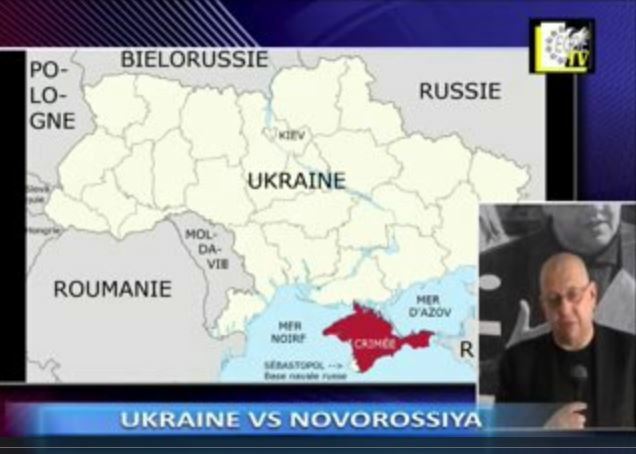 # AFRIQUE MEDIA co-produced a series of special programs with geopolitical expert Luc MICHEL and his EODE-TV channel on the theme: UKRAINE VERSUS NOVOROSSIYA, the Ukrainian crisis. The most comprehensive information on the crisis in Ukraine and the Black Sea. With Luc MICHEL, geopolitical expert and expert on Russian and Ukrainian worlds, we'll find out inside information. Our expert knows intimately indeed the region. Since the 80s, Luc MICHEL has traveled throughout Eastern Europe: Baltics, Central Europe, Russia, Siberia, Ukraine, Belarus, Yugoslavia, Caucasus, Balkans … Sometimes observer, often actor of events. Many missions for his NGO EODE that organizes electoral monitoring and makes "parallel diplomacy" according to the Belgian press. Many political actions and conferences for his transnational political organization in Eurasia, the PCN-NCP. He especially knows Ukraine, Moldova and Transdniestria (PMR), and other countries of the Black Sea and the Balkans. Finally he also directed his private life to the east, Ukrainian girlfriend, then married to a Russian from Riga. His current wife is a native of Transylvania. This entry was posted in # EODE - ZONE BALKANS-BLACK SEA, # EODE - ZONE RUSSIA-CAUCASUS, # EODE TV, * English and tagged AFRIQUE MEDIA TV, Bashir Mohamed Ladan, Black Sea, Crimea, EODE-TV, European Union, Ibrahim Kamgue, Luc MICHEL, NATO, Novorossiya, PCN-NCP, Romain Mbomnda, Simferopol, Ukraine. Bookmark the permalink.